Spicer Brothers Produce's closure has opened up a large piece of property at a key intersection in Oregon City that could define the tone of development in the area for decades to come. According to the Clackamas County assessor's office, the 0.67-acre property at 508 14th St. is worth about $1 million. The old approximately 2,800-square-foot Spicer Brothers building is estimated to be worth about $208,000 out of the total $1.084 million market price with the land, but it's likely that a serious developer would want to raze the current building and start with a clean slate for building something else. The current one-story poured concrete structure was built around 1940 and has survived flooding in every major rise of the Willamette River since, including 1948, 1964 and 1996. Graham Peterson, the Spicers' real-estate agent, says it will be up to the market to determine the final price. "We're probably not going to put a price on it," Peterson said. "A million-plus is kind of our minimum, unless someone comes forward with a stronger offer, but you never know what the market will bear." Keith and Nancy Spicer bought the property for $250,000 in 1999 and subsequently gave the business to their two sons to run. "Keith put his heart and soul into this building, and this is kind of his retirement, so whatever fulfills the retirement goals for Keith is the end goal," Peterson said. As part of the mixed-use zoning district downtown, the property is eligible for some of the densest development in Oregon City. A height limit of 58 feet remains in place. According to the city's municipal code, "A mix of high-density residential, office and retail uses are encouraged in this district, with retail and service uses on the ground floor and office and residential uses on the upper floors. The emphasis is on those uses that encourage pedestrian and transit use." Peterson agrees that the site is ideal for such a multistory development. Hotels, live/work units or retail establishments are permitted in this district, including grocery, hardware stores, gift shops, bakeries, delicatessens, florists, pharmacies and specialty stores. If the developers were to build three floors of residential housing on top of retail, for example, the property would be eligible for a 60 percent tax break on additional property value created by the development. The breaks would go toward the property's city taxes for 10 years, thanks to the Vertical Housing Program administered by the Oregon Housing and Community Services. Peterson added that a new Opportunity Zone allows potential developers in downtown Oregon City census tracts to invest capital gains from other types of investments and defer taxes or possibly avoid having to pay capital gains taxes all together, depending on the length of the investment and its relative size. The amount of tax advantage is case-dependent and spelled out in the new tax overhaul passed by Republicans in Congress this year. "The best project would be a high-density, mixed-use development with retail and/or office and multifamily above that," Peterson said. "That sort of development would allow someone to leverage the Opportunity Zone, vertical housing tax credits and possibly urban-renewal funds, and maximize the mixed-use downtown zoning." Spicer Brothers Produce's closure in early October surprised the community as the business was celebrating its 30th anniversary with some major changes. Spicer Brothers recently had invested large sums in the business by adding a smoothie and waffle bar. "We were working as hard as we possibly could right up until the moment we had to call," Chris Spicer said. "So we didn't really know until just before we made the announcement either." 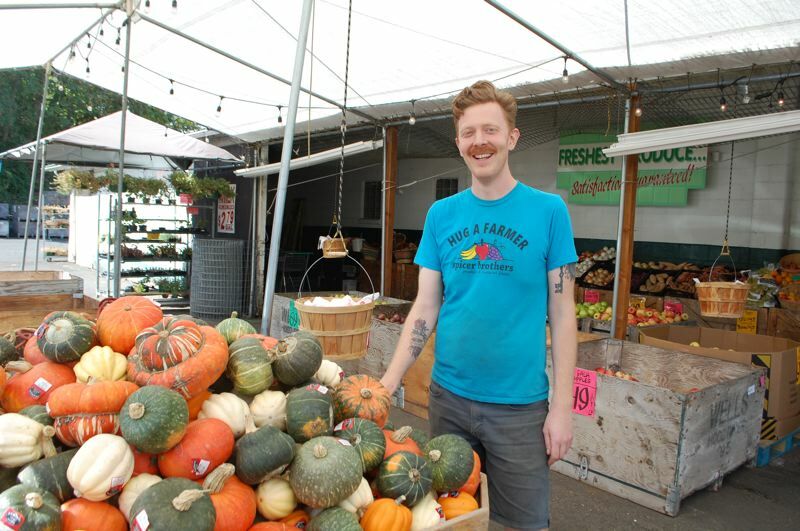 Potential sale of the Spicer Brothers property once again has inflamed rumors that New Seasons might build a grocery store in Oregon City, especially with Andy Spicer deciding to take a job with the company just a few months before Spicer Brothers closed its store. Chris Spicer and his wife, Jen, became the sole owners of the Spicer Brothers business after they determined that the business couldn't financially support both brothers, and Andy decided to take the job with New Seasons. Andy remains involved in the community, promoting local businesses as a Downtown Oregon City Association board member, and both brothers say there was no bad blood in the parting. A free-standing building over 60,000 square feet could be built as long as the building contains multiple stores, but big-box stores are discouraged by downtown Oregon City zoning. This zoning would still allow for a New Seasons, which typically builds grocery stores around 17,000-18,000 square feet. Peterson made it clear that the property will be sold on the open market to a developer who can maximize the opportunity of the site. "It's up to the buyer, but we're targeting the highest and best use," he said. Chris Spicer was 2 and Andy was 4 when their father founded the iconic Oregon City business in 1988. Peterson and the Spicers have not ruled out leasing the former grocery store if market conditions aren't right for a sale this year.